When I step onto the course, windmills, bumpers, and screaming children are usually involved. 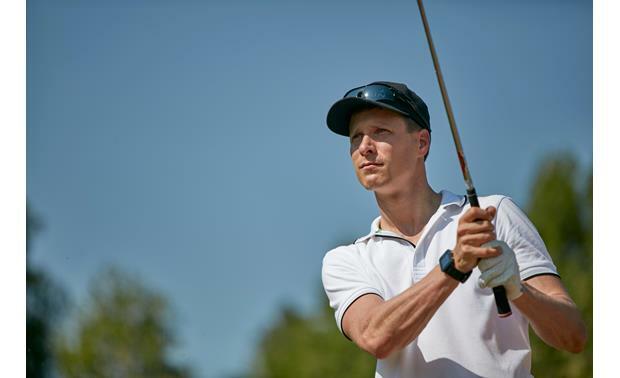 When I step onto the course, windmills, bumpers, and screaming children are usually involved. I'm talking about miniature golf, of course. But if Garmin's Approach S20 golf GPS watch had been available back in the day, I might be a serious golf fanatic right now. The Approach S20 gives you the information you need right on your wrist so you can choose your next shot with confidence. And with over 41,000 preloaded international courses at your disposal, you can take Garmin's expert guidance with you just about anywhere. 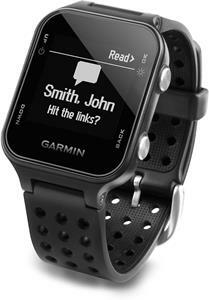 The watch's built-in GPS receiver finds you automatically and stays dialed in to your location. 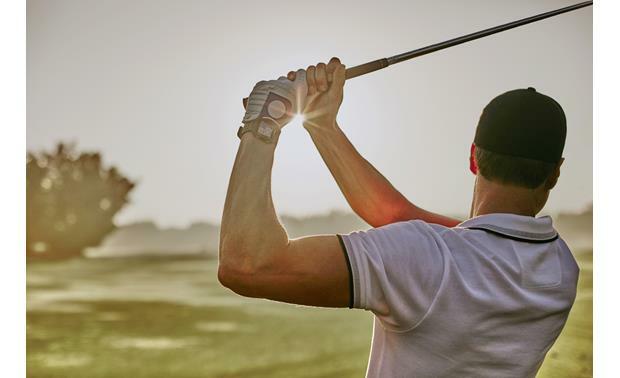 When it's taking forever to get to the 18th hole, you don't want your device to run out of steam before you do. The Approach S20's built-in rechargeable battery offers up to 15 hours of juice in GPS mode, or 8 weeks as a regular watch. The watch's waterproof construction lets you enjoy it in rough weather. You can even take it for a swim, as it'll handle depths of up to 50 meters. Use it as a fitness tracker by employing its built-in odometer to help you set everyday activity goals based on your prior movement level. It'll even remind you to get moving if you've been sedentary for too long. Do you get nervous the night before a big match? The Approach S20's sleep monitor can help you track your total sleep and periods of movement or restless sleep. And its alarm clock will ensure you never miss an early tee time. The Approach S20 gives you distances to the front, back, and center of the green, plus distances to doglegs and layups. You can even get a closer look at the green and move the pin to suit your location. One glance at your wrist offers you a wealth of information with clear, easy-to-read numbering. 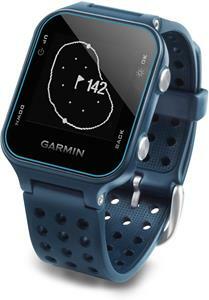 The Approach S20 tracks your shots and records shot locations as you move through the course. It'll accurately determine the distance of each shot so you don't have to guess. 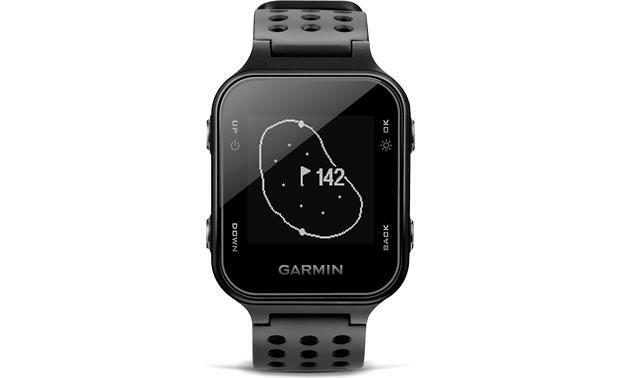 Once you've completed your game, you can see your results online using Garmin Connect. 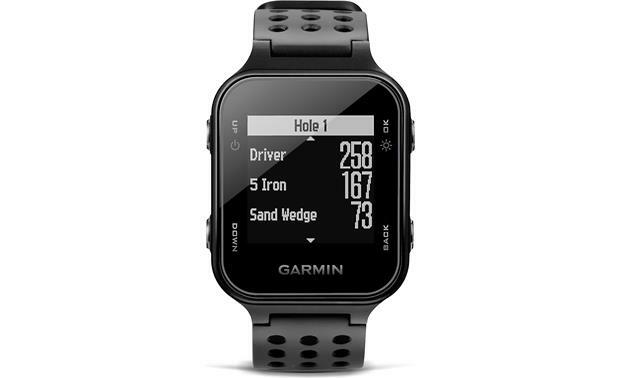 Garmin Connect is where your golf game lives online. Set up a free account and use it to track your stats and get in-depth analysis using the watch's data. You can share your stats and results with other users locally and around the world. Add the Garmin Connect app to your smartphone, and it'll enable automatic course updates for your favorite spots to the Approach S20 when the devices are paired. Want to analyze your game for future improvement? The Approach S20 lets you track your putts per round, greens and fairways hit, and average distance of your strokes. It also offers digital scorecard options for individual players, including Stroke Play and Stableford. You can save, review, and print scorecards from your computer. If you're worried about missing important texts, calls, alerts, and emails on the course, you can pair the Approach S20 with most recent iPhone® models and select Android™ models through Bluetooth® low energy, then receive notifications directly on the watch's face, so you can safely leave your phone in your bag. Garmin's extensive course database comes already loaded on the Approach S20, so you won't need any subscriptions or additional downloads to enjoy it. Simply charge it up, throw on your golf cleats, and you're ready to go. You can obtain new course update downloads directly from Garmin's website. The Approach S20 works with Garmin's TruSwing sensor to provide detailed metrics that'll help you make your swing consistent and accurate. You'll get feedback on crucial components of your movements to keep you on target, including 3-D animations when using the Garmin Connect online platform. Very accurate yardage readings but could be more intuitive to use. A lot easier to use than laser range finder! how does one know the Garmin approach s20 is charging when it is plugged in to charger? I don't have any indication that the watch is charging. So far, it works every time I use it since I charge it every time after I use it. Good question! Overview: The Garmin Approach S20 is a wrist-worn golf GPS unit with over 40,000 pre-loaded worldwide golf courses. It features a slim, fully-hinged design that weighs only 1.5 ounces for a comfortable fit. The Approach S20 uses a high-sensitivity GPS receiver to measure individual shot distances and show the exact yardage to fairways, hazards, and greens. No subscriptions or setup fees are required. Approach S20 is compliant with USGA rules. Display: The Approach S20 has a 0.9" x 0.9" high-resolution monochrome display with a resolution of 128 x 128 pixels. The high-contrast selectable (positive or negative) display is easily readable in bright sunlight. Water Resistance: The S20 has a 5 ATM rating, which means that the case can withstand accidental immersion in 50 meters of water for up to 30 minutes. Play Mode: As you play, the Approach S20's Hole View automatically updates your position, giving you the exact yardage to the front, center, and back of the green. The Green View shows the shape of the green, and allows you to set a more accurate pin position by manually moving the flag to its location. Hazards, Layups, and Doglegs: The S20 lets you view hole characteristics that affect shot selection along the fairways on Par 4 and Par 5 holes. Hazards are identified at the top of the screen (bunker, water, etc. ), and the distances to the front and back of the hazard are given. You can view a list of layup and dogleg distances for Par 4 and 5 holes, and the distance to reach each layup. Measuring a Shot: The Approach S20 can measure the distance of a particular shot. After hitting the shot, you can select "Measure Shot" in the menu and walk to your ball to calculate the distance. 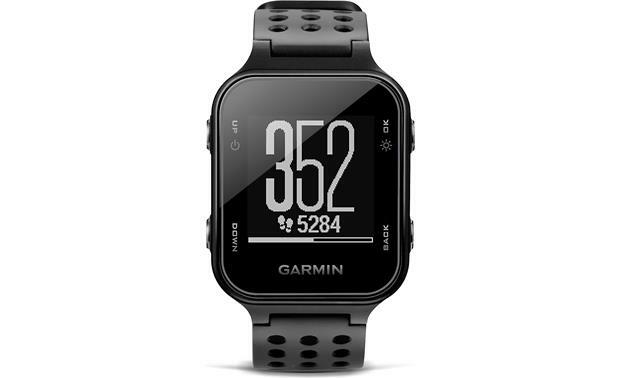 Smartphone Compatible: The Garmin Approach S20 can be paired to your smartphone (via Bluetooth) through the Garmin Connect mobile app. Once your phone is paired, you can receive notifications of phone calls and text messages during your round. 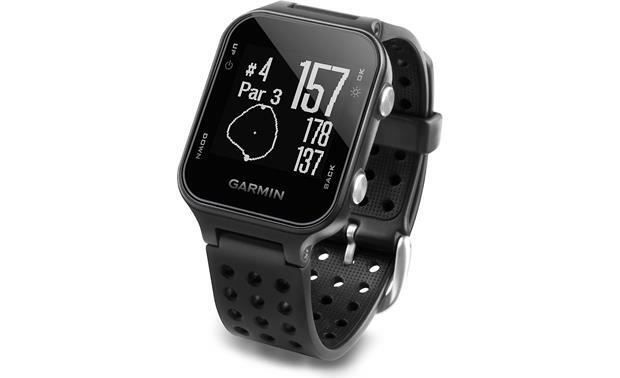 TruSwing: The optional Garmin TruSwing golf swing sensor mounts to your club, and pairs to the S20 via Bluetooth Low Energy (BLE). TruSwing provides swing metrics to see how your mechanics affect ball flight and shot results. It measures your swing tempo and speed, face to target, dynamic loft, shaft angle, club path and coordinates, and shaft lean. After your shot, the swing measurements are displayed on the S20 so you can instantly analyze the shot. Digital Scorecard: The Approach S20 doubles as a digital scorecard, helping you keep your score and other statistics. When scoring is enabled, you will be prompted to enter your score when your are on the green. If you also enable statistics tracking, you will be prompted to enter other stats such as number of putts, and fairways hit (or whether you missed left or right). 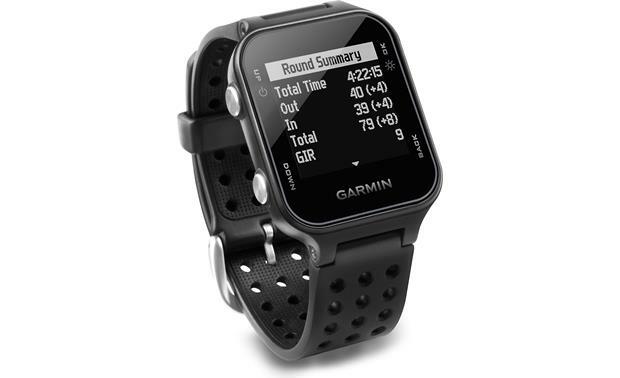 When your round is completed, you can upload your scorecard to Garmin Connect using the Garmin Express application. Garmin Connect: You can keep track of your golf game using Garmin Connect, an online community created for users of Garmin sports devices. You can upload all of the stats from the Approach S20 and analyze them over time. You can share your scorecards with friends, and compare your rounds to other people you've played against. You can also view your longest shots, average score, average putts, average score by par, and overall fairways hit. Other Functions: When you're not on the links, you can use the Approach S20 as a watch, alarm clock, and activity tracker. The activity tracking feature records your daily step count, step goal, distance traveled, and calories burned for each recorded day. It also has a Move Alert feature that reminds you to get up and move about after one hour of inactivity. The S20 can also monitor your sleep, with measurements of total sleep, periods of movement, and restful sleep. Power Requirements: The Approach S20 operates on a built-in Lithium-Ion rechargeable battery. A fully charged battery lasts for up 15 hours (in GPS mode), and up to 8 weeks in activity mode. The unit has four small metal contacts on the back of the device for connecting the supplied clip-on charger/data cable. 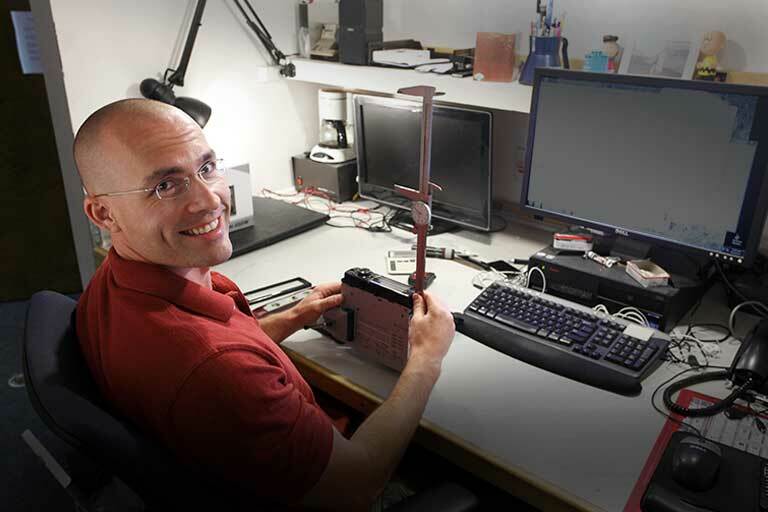 The cable can be used to connect to your computer for downloading course and firmware updates, uploading scorecards, and charging the battery. You will see the battery indicator on the display charging. It will show the percentage charged. A symbol shows up on the battery indicator. Annoy remember if it looks like a plug or a lightening bolt but you get a symbol.